My paintings are about the act of looking and the construction of a viewing experience. My recent dimensional paintings refer to both real spaces and architectural models. The images in these shaped formats shift as one sees them from different angles because of the folded edges, reflective surfaces, and perspective that lines up from one spot but not from another. I am interested in cultivating the viewers awareness of shifting points of view in relation to both the paintings and how one experiences real space. 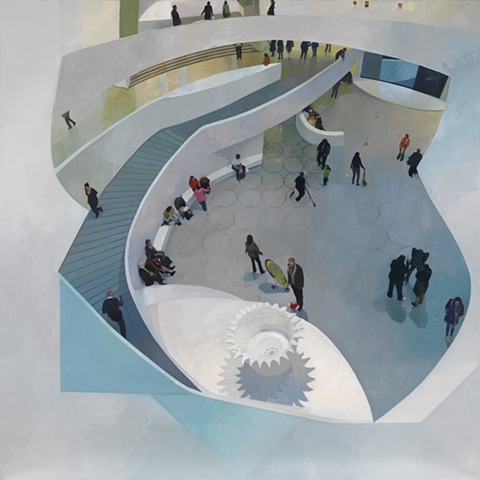 "Clancy often situates her viewer at the disorienting edge of balconies to foreground the spectacle of looking, and the diminished presence of paintings on the walls suggests the highly constructed nature of viewing art in these galleries. Details such as cameras, maps, and guidebooks in the hands of the figures playfully, yet subtly, allude to the mediated nature of museum-going."